The Cantilever Aluminium Scaffold Tower is most commonly used to work over existing obstacles on the ground, such as stairs, porches, machinery or anything else that won’t budge. They’re used by construction workers, painters, gutter repair crews and homeowners who have to work at height over the top of an obstacle. The Cantilever Scaffold Tower comes in 13 pieces, so it’s easy to add to an existing scaffold tower, and the whole set up takes just 30 minutes. Slips, trips and falls cost society an estimated £800 million each year, according to the Health and Safety Executive. The most recent figures showed that there were 40 fatalities, 15,000 major injuries and over 30,000 workers needing more than three days off work in 2010. For construction workers, falls from heights remains the #1 cause of accidents. 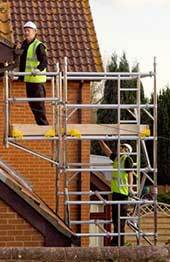 The HSE recommends using scaffolding tower that has double guardrails, toe boards and no gaps or lapped boards. Lakeside-Hire offers a Cantilever Scaffold Tower for commercial and domestic markets that fits all these safety criteria. Best of all, Lakeside-Hire provides the most affordable Cantilever Scaffold Tower hire on the block. Others offer the Cantilever Scaffold Tower for £41.80 per week, but Lakeside-Hire has Cantilever Scaffold Tower addition for just £25.00 per week. Instead of paying salespeople and marketers, Lakeside-Hire is a small, customer-centric business that strives to offer the best safety equipment delivered to your site for a guaranteed AM delivery. The stock is prepared by PAMSA trained staff, giving you confidence that you will always be using that safest scaffold tower on site.